The Way of the Future? | Words, By George! This report should not be seen as an advertisement for a car, nor is it an endorsement of the maufacturer of the vehicle described herein. I dont normally consider myself “green”, but rather environmentally responsible. However I did come accross this interesting reference to a new technology which I found to be rather exciting. The “all-electric” car was a concept which I found intriguing, and perhaps the future of how electric cars should and will be. Enter the Holden “Chevrolet” Volt! Many hybrids have always appeared to be a half-hearted approach to the electric vehicle (EV). The Volt,with its unique Voltec electric drive system, could well be the ground-breaker for EV cars of the future. It is an all electric car, but then again it’s not! It does have a small petrol engine. Then it’s not really a hybrid either. Hybrids couple a conventional internal combustion engine (ICE) to an electric motor and utilise both. Depending on the driving conditions, these engines are used either individually or paired to drive the wheels. Not so the Volt! The function of the petrol engine is to drive the generator which recharges the battery. At high speeds, or under heavy load, the generator also provides additional drive through the planetary gears. The electrics are connected to and drive the wheels, not the ICE. The Volt has a 111kW and 368Nm electric motor that drives the wheels and a lithium-ion battery to power the electric motor. The Volt also has a 1.4 litre (63kW) petrol engine that drives a generator to charge the battery pack. Maximum torque in an electric engine is available throughout its power band. However and most importantly the Volt can be recharged by plugging into a home powerpoint. The cost of doing a full recharge is about AU$2.50. The range of the Volt is “unlimited”. The owner need never plug it itno a powerpoint to recharge it as the petrol engine will keep the battery fully charged. Until the petrol engine runs out of fuel! It’s not a unique technology, diesel-elecrtic trains have been using a similar system for years, but it’s nver been used in a car before. The combination of technologies will give the Volt a range of 500km before recharging or refuelling. To continue further, you don’t need to find a powerpoint, you only need find a petrol station. The car will similarly sized to their existing Vectra, which means it will be a full bodied sedan (wagon). 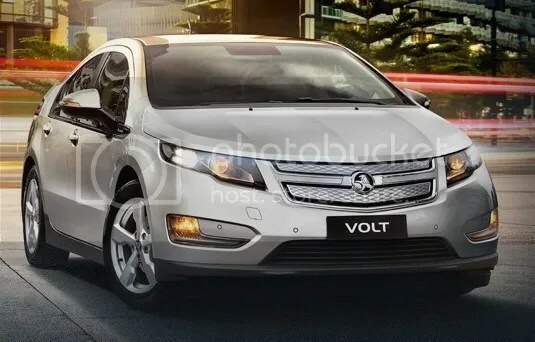 On the down-side, if there is a downside, the Volt is expected to go on the market for around AU$60,000. It could be argued that the reduction in fuel costs will offset that steep purchase price. The green community will probably endorse the vehicle as it’s carbon footprint should be markedly reduced. It will certainly appeal to the environmentally responsible amongst us! The only question I ask is this: What is the longevity of the batteries, and what will be the cost to replace them?